The Attorney-General of the Federation and Minister of Justice, Mr Abubakar Malami, has denied an alleged plot to reverse the Supreme Court judgment on the Rivers State chapter of the All Progressives Congress. Recall that owing to an internal crisis in the state chapter of the party that dragged up to the apex court, it was barred from fielding candidates for the 2019 elections. But opposition Peoples Democratic Party, which won most of the elective positions, including the re-election of Governor Nyesom Wike, had alleged on Sunday that there was a plot to reverse the court judgment. It claimed that this would lead to a repeat poll where the APC would contest. The opposition party had mentioned Malami as the one to mount pressure on the acting Chief Justice of Nigeria, Justice Tanko Mohammed, to effect the reversal. 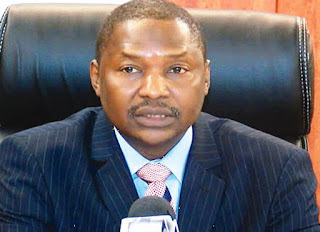 However, dismissing the allegation on Wednesday in Abuja, Malami said the PDP exercised its power of freedom of speech in excess. In an interview with State House correspondents, the minister said, “Regarding what was levelled against me by the PDP, I think it remains an accusation. “It has to remain so until proven through a judicial process. The PDP had also named the Minister of Transportation, Rotimi Amaechi, as working with Malami to achieve the alleged reversal of the apex court’s decision.